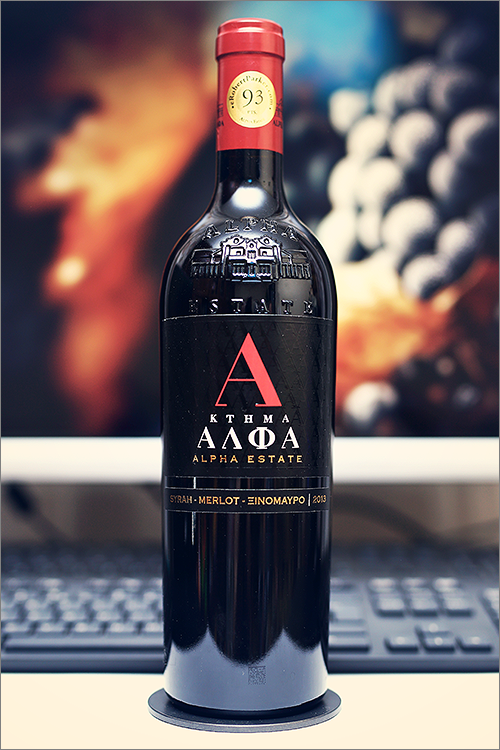 Tonight we are going to review a wine that we were eager to try for such a long time and finally here it is – Syrah – Merlot – Xynomavro 2013 from Alpha Estate. This wine is part of the winemaker’s ‘super premium’ line, that is made of only three wines, and is a blend of syrah, merlot and xynomavro grape varieties, all of them grown in the Amyndeon plateau, situated at the 660m altitude in north-western Macedonia, in the so-called “Childrens & Horses” sub-region of Greece. The wine was aged on the lees for 8 months, followed by 12 months of ageing in new french oak casks and finally by 12 months of bottle-ageing. Quite impressive, but let’s not put too much emphasis on the theory – on to the tasting! Pale but elegant garnet color, with hazy copper hues towards the rim of the glass. The nose is strong, filled mostly with black fruits and spice: black cherry, blackcurrant, ripe sour cherry, black plum, overripe black mulberry, blackberry, black raspberry and walnut. An instant later the nose is filled with elegant notes of roasted oakwood, tobacco, leather, nutmeg, cherry tree wood, red and black pepper and some subtle hints black tea. The wine is extra-dry, with high alcohol level, high acidity and firm tannin. It feels bold, extracted and complex, with overwhelming fruitiness and a quite tannic grip on the mouthfeel. This is definitely new-world type of wine – firm, elegant and woody-oaky, as it tastes seedy, spicy and expressive. The wine has a very good overall balance between fruit and barrique, with the main accent on the ripe tannins. It has a long finish and a velvety-crisp aftertaste. This is definitely a great Wine of Greece and the overall rating says the same, with 91.8 points scored it is right there, among the best wines we’ve tasted so far. Please click on the chart icon on the left in order to get to the wine rating page, where you can find all the wines we’ve tasted to date. Conclusion: this is definitely a wine in its prime form, right there, in on the summit of its potential – fruity, oaky and extracted. This wine does not ask for any more bottle ageing, as it already developed into a genuine, fully mature blend, that offers an explosion of black fruits and tannins. This is a rare example when all the conditions are in place, which, for a new-world type of wine is a rarity and therefore a pure delight. More than that, this wine was awarded 93 Parker points, which is quite an accomplishment if you ask us. We would suggest to go all-in and pair this wine with a new-world-style grilled tomahawk steak with chimichurri compound butter or a new york skillet steak with garlic butter, herbs and potatoes, as one cannot go wrong with any of these two. Enjoy!